Fairly often, we have an engaged couple take a look at our work and fall in love with two wedding suites. In this case, Jenny & Michael picked our Hudson and Vintage NYC designs, and we found a way to merge the two. They loved the modern type choices of one, and the New York city details of another. In the end, the design looked perfect for their NYC wedding - classy, but fun! We've printed a few London weddings featuring tinted letterpressed illustrations related to the British capital. So we thought we would add a new design that incorporates the New York skyline for all the Manhattan weddings we work on! The use of a very pale tinted ink on the motif really intensifies the letterpress effect and makes the image appear almost like a shadow. 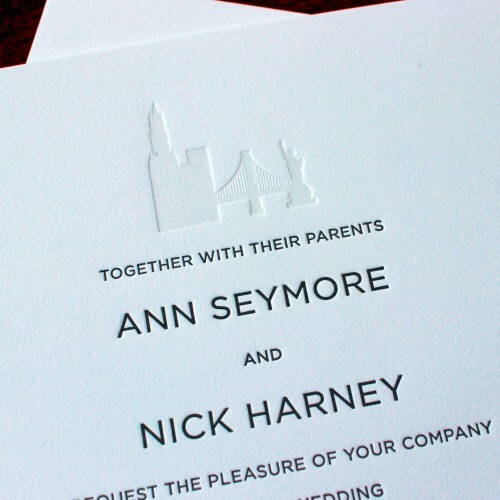 The result is an invitation that is both classy and understated.